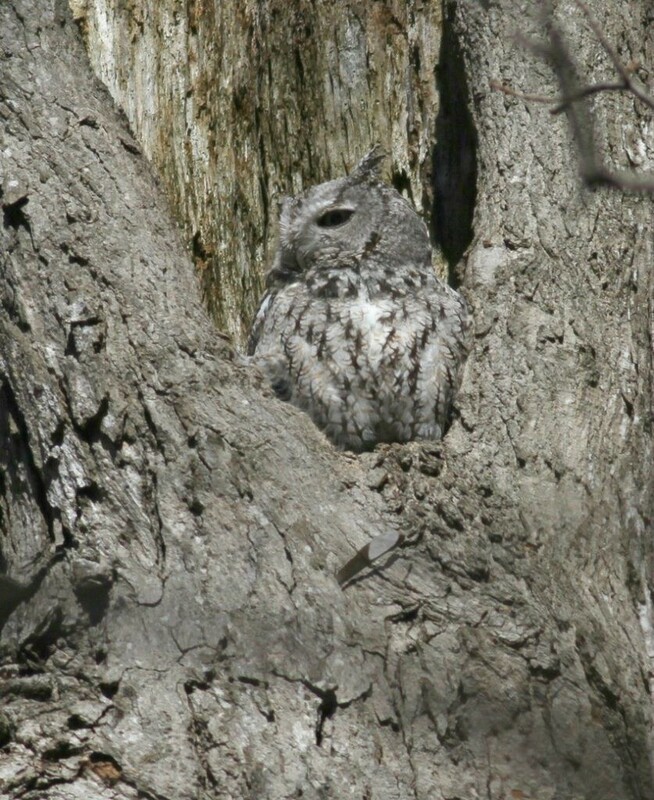 While out birding this morning along the lakefront in Milwaukee I received a tip of Great Horned Owl with 3 owlets. Birding was a little slow along the lakefront where I was with nothing really going on so I made the drive to check these cuties out. When I arrived there were 3 owlets in a row on one limb. The adult female stopped in a couple times to check on the little ones but did not hang around. I’m not sure how old these owlets are but I’m sure they will be flying some soon and spreading out in the tree some too. It was a nice opportunity to see the first owlets of the spring. It was a bright sunny day with little wind but chilly at first. Images were taken on April 27, 2018. While birding today in Milwaukee County I discovered a Barred Owl resting on a limb. Nice to see them just relaxing in their space and blending in with the surroundings. I took a few shots and left the area. A beautiful February day with full sun and mild temps in the 30’s with low winds. Images were taken on February 18, 2018. I came upon a Long-eared Owl today while birding in Milwaukee County. It gave nice views from a distance. It appeared the owl had just eaten something as there was blood on the bottom of its face. I viewed the owl for a minute or so and then left the area. Image was taken on February 6, 2018. The last few weeks I looked extensively for the elusive Northern Saw-whet Owl. Recently while out birding, I was checking out some more trees. I was excited to find a fresh pellet on the ground, then a short distance away, a cute Northern Saw-whet Owl was staring at me. I have never seen a Northern Saw-whet Owl before, captive or wild so this was a real treat and a life bird too. Not moving much, I put my camera up, took a few shots of this beautiful owl. I would tell anyone who asks, how do you find a Northern Saw-whet Owl? Look in the pine trees around you. You just might be surprised to find one like I was and be rewarded too with a photo. A mostly cloudy day, temps in the mid 40’s, with steady winds.